9.25.18 Want to know how much higher prices might be with China still in the market or what U.S. Wheat Associates describes as a trade time bomb? Have you heard about the fourth GE wheat discovery or the Food and Drug Administration’s investigation of pulse heavy dog food diets? Episode 92 of Wheat All About It, entitled The World Wheat O’Clock Report, brings listeners news about our favorite crop as well as stories that affect agriculture across the Pacific Northwest and the nation. 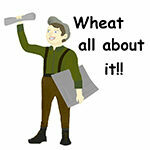 In addition to iTunes, you can now subscribe to Wheat All About It on the podcast platform, Stitcher.